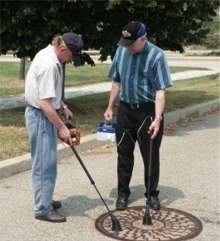 Natural Gas detection instruments are used industry wide to survey, pinpoint and grade leaks wherever they occur. Natural Gas Utilities attempt to survey as efficiently and reliably as possible. Currently two classes of instruments are widely used. The first is the Flame Ionization Detector (FID), which is used for trace (parts-per-million) detection. The second is the Combustible Gas Indicator (CGI), which is generally used for high concentration applications, such as measurements in bar holes at leak sites to pinpoint exact excavation locations. The FID technology is outdated, cumbersome, slow, and costly to maintain. Natural Gas Utilities are in the process of replacing many FID detection instruments. Some laser based systems have been developed, but they are either very costly and difficult to use mid-IR instruments, or somewhat costly lower sensitivity near-IR systems. The dominant new emerging technology is optical detection. The Portable Methane Detector (PMD) has been tested to be among the best performing and lowest cost optical detection replacement alternatives. The PMD also allows for the combination of the FID and CGI functions in one instrument and can be easily adapted for vehicle surveys both on the ground and in the air. The PMD has demonstrated among the best performance and the best cost/performance ratio of the new techniques. Through the Gas Technology Institute OTD program, several large U.S. gas utilities have participated in research and development of the PMD, including APGA RF, Avista/Intermountain, ConEd, Keyspan, NYSEG/RGE, Nicor, NiSource, NW Natural Gas, PSE&G, Questar, SoCal, and TECO. The Portable Methane Detector is a new handheld portable optical methane detector developed as an international replacement natural gas detection technology for a consortium of Natural Gas Utilility (NGU) companies in the US and internationally. As a small, lightweight, battery operated portable instrument, the PMD leverages the advantages of the optical methane detector to the much larger handheld leak survey detector market. Lechtzer Incorporated was founded primarily to commercialize the portable technologies and continue to bring a variety of related products to market. 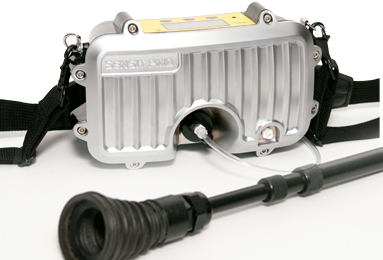 The Portable Methane Detector is a fully developed instrument ready for commercialization. A number of PMD prototypes have been produced and have been successfully field tested by several of the utility sponsors in various configurations.. Lechtzer Inc. is now working to asist in the manufacturing and distribution of the PMD with an established company already providing instruments to the NGUs. In addition to commercializing the existing prototypes, Lechtzer Incorporated is also active in developing modifications of this technology, including new instruments, patent and related licensing work, field trials and software. Battery pack weight 1.5 – 3 lbs.